Bulldogs finalise team to take on West Coast Eagles, with three inclusions. Rookie utility Daniel Pearce has been elevated to the Club’s primary list. The spotlight is turned on the 2014 season of Daniel Pearce. Pearce is a small utility who can break lines playing in defence and through the midfield. His overhead marking is another of his strengths. Pearce was taken with the Bulldogs third round selection in the 2011 AFL National Draft (pick 49 overall). 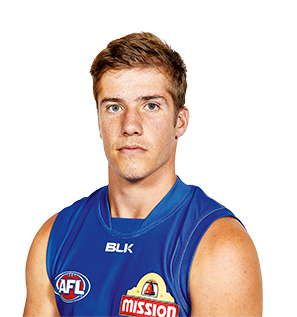 Pearce was delisted at the end of the 2014 season, before being redrafted in the 2015 AFL Rookie Draft. After an impressive debut season in 2012 with five senior games, Pearce has not played a senior game since. Pearce missed the start of 2014 due to injury, but was able to play the last nine games of the VFL season, and was part of the Footscray premiership winning side. Pearce was delisted at the end of the 2014 season, and was re-drafted to the rookie list and will be looking to further develop his game in 2015. Pearce averaged 12 disposals in the VFL in 2014. “We will give Daniel every opportunity to continue to develop at our club, albeit as a rookie. Having played five matches in his debut 2012 season, Pearce spent 2013 with Williamstown. In 19 matches for the Seagulls, the small utility showed encouraging signs of development. The extended run at VFL level allowed him to spend more game time on the wing and occasionally push forward, after initially being groomed in defence. A 30 disposal game against Frankston should bolster Pearce’s confidence in searching for more opportunities with the Bulldogs in 2014. A relatively uninterrupted season saw Pearce play 20 games in the VFL this year – with just one of those in the development league. The boost in exposure to regular games will help his development in the long run. Pearce was given his AFL chance with a call up in round 9 against Geelong. The 2011 draftee was promising in his debut season, particularly as he adjusted to the faster tempo of senior football. The teenager hit his stride in round 19 against North Melbourne, collecting 17 possessions at 82% disposal efficiency. The extended run in the seniors saw the Oakleigh Chargers recruit begin to really show glimpses of what he is capable of. He finished with seven marks, three rebound 50s and four inside 50s. His season was cut short with a hamstring injury. An athletic midfielder with terrific natural leap and marking ability. Can play in a range of positions and had an excellent year with the Oakleigh Chargers, finishing fourth in the best and fairest. Has a basketball background with the Bulleen Boomers, which has helped develop his decision-making and clean ball-handling.